High-latitude coral reefs (HLRs) are potentially vulnerable marine ecosystems facing welldocumented threats to tropical reefs and exposure to suboptimal temperatures and insolation. In addition, because of their geographic isolation, HLRs may have poor or erratic larval connections to tropical reefs and a reduced genetic diversity and capacity to respond to environmental change. On Australia抯 east coast, a system of marine protected areas (MPAs) has been established with the aim of conserving HLRs in part by providing sources of colonizing larvae. To examine the effectiveness of existing MPAs as networks for dispersal, we compared genetic diversity within and among the HLRs in MPAs and between these HLRs and tropical reefs on the southern Great Barrier Reef (GBR). 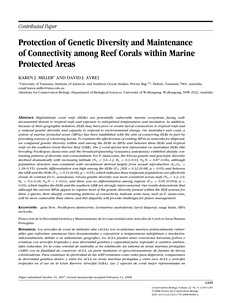 The 2 coral species best represented on Australian HLRs (the brooding Pocillopora damicornis and the broadcast-spawning Goniastrea australensis) exhibited sharply contrasting patterns of diversity and connectedness. For P. damicornis, the 8-locus genetic and genotypic diversity declined dramatically with increasing latitude (Na = 3.6�2, He = 0.3�03, Ng:N = 0.87�06), although population structure was consistent with recruitment derived largely from sexual reproduction (Go:Ge = 1.28�55). Genetic differentiation was high among the HLRs (FST [SD] = 0.32 [0.08], p < 0.05) and between the GBR and the HLRs (FST = 0.24 [0.06], p < 0.05), which indicates these temperate populations are effectively closed. In contrast for G. australensis, 9-locus genetic diversity was more consistent across reefs (Na = 4.2�9, He = 0.3�26, Ng:N = 1�61), and there was no differentiation among regions (FST = 0.00 [0.004], p > 0.05), which implies the HLRs and the southern GBR are strongly interconnected. Our results demonstrate that although the current MPAs appear to capture most of the genetic diversity present within the HLR systems for these 2 species, their sharply contrasting patterns of connectivity indicate some taxa, such as P. damicornis, will be more vulnerable than others, and this disparity will provide challenges for future management.